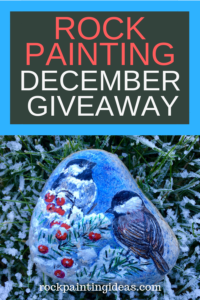 The Winter Birds Painted Rock Giveaway for December 2018 is here. To win this beautiful rock, all you have to do is become a subscriber to the Rock Painting Ideas newsletter and live in the United States or Canada. Winter Birds will be given away on January 1st, 2019. Every month from now on, all eligible subscribers will be entered to win the rock of the month. One winner will receive this gorgeous rock. This rock was painted by Christine Rufino and I purchased the rock from her store on Etsy. You can find her PaintRiver store here. To be fair on the giveaway, I will be simply asking my Rock Painting Ideas and Resources group to pick a number, and the subscriber that is that number will be the winner! As the subscriber list grows, more rocks will be given away. Please note: I will be emailing the winner on the 1st of every month. If I don’t hear from the winner within a week, I will be picking a new winner! Subscribe to win and also receive tips, interviews with artists and ideas on how to create the best rocks around. You wouldn’t want to miss a single post. Make sure you join our Facebook group Rock Painting Ideas and Resources. It has over 25,000 rock painting enthusiasts just like you sharing ideas on what to paint and the best ideas out there. It offers daily inspiration, tips and techniques. Plus, you wouldn’t want to miss out on all the fun! You can join this group here. If you want to get started on rock painting – check out the resources below. You want smooth flat rocks to create your masterpiece unless an unusual rock acts as the body of your art piece. 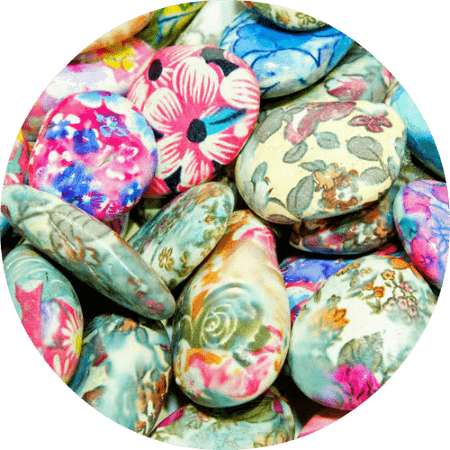 Keep your artwork ideas in mind when selecting the perfect stones. Make sure you’re able to remove stones from where you find them. Removing stones from National and state parks isn’t okay. Taking rocks from waterways can also be against the rules. It’s also illegal to take rocks from railroad tracks. If you live in an area that it’s hard to find rocks, head over to your nearest home improvement center, landscape supply store and garden centers to purchase some. Amazon ships this 30 pound bag of rocks for a great price. Paint won’t stick to dirty rocks. A smooth surface is what we’re aiming for, so washing your rocks in warm water and soap will ensure that. You might want scrub it with an old toothbrush to make sure all debris is removed. Allow rocks to dry before painting. If there is any light bumps or grit on your rock, you can sand using 150 grit sandpaper. For best results, you’ll want to prime your rocks especially if the rock is pitted. This gesso primer is perfect for smooth results. You can find out more here. Use acrylic patio paint for best results if you will be hiding your rocks outside. Adding a white layer before painting the color you want makes it pop. Let each layer of paint dry before applying the next layer. You can find acrylic patio paints here. Shift paint is paint that shifts color as you look at what you painted. Shift paint can be found here. A selection of various sized paint brushes will help you create the perfect look you are going for. This set has an amazing variety of sizes. They say watercolor paint brushes, but work wonderfully with acrylic paint. You can find them here. Adding text with markers is easier than painting words. Through trial and error, I have found that Posca Markers work best for rock painting. Make sure you look at the tip size before purchasing to make sure you have the right size. I use the Ultra thin tip for outlining and writing words. You can find them here. You could also buy this amazing set on Amazon. It’s the BUNDLE SET. This Fineline Applicator lets you control your artwork. You can find a set here. These Fineline Applicator tops easily screw on to your paint. You can find them here. Dotting tools make perfectly round dots. You can find a set on Amazon for an AMAZING price. Here’s an inexpensive set of dotting tools and paint brushes combined. You can find them here. This is one of the most important steps to rock painting. All that hard work that you put into your stone would be wasted with any type of moisture. You want a seal that won’t curdle if the stones are subject to the outdoor weather. Krylon Colormaster Spray is what I use. Two thin coats works best. You could also use Krylon Low Odor Clear Finish. You can find it here. For a non-toxic sealer, you can use DecoArt Varnish. You can find it here. How many have us have been guilty of not cleaning our brushes right away and throwing out a rarely used brush because of it? Soak your paint brushes in this and you’ll never have to do that again. It’s important to stay organized while you’re painting rocks. This wonderful paint brush stand will have your brushes ready when you want to paint. You can find it here. Here are my favorite books on rock painting. You can’t beat the price and you learn so many different styles. The Art of Stone Painting is a treasure chest full of amazing art that teaches you to create them too. You can find it here. Mandala Stones will teach you how to master your dotting. You can find it here. Art on the Rocks: 35 Rock Painting Projects and Tips. You can find it here. 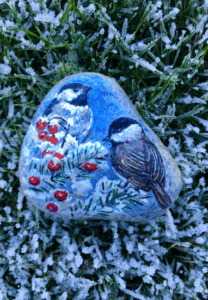 We’ve reached the end of the Winter Bird Painted Rock Giveaway. Don’t forget to subscribe to our newsletter to be eligible to win our monthly rock giveaway. Don’t forget to check out Rock Painting Ideas & Resources Facebook group here. Thank you so much for visiting. Check out our other blog posts on rock painting. Rock On! where do I leave a number for the drawing? 777 is my choice. Hello! My name is Kelly. Welcome to Rock Painting Ideas. I love everything about the rock painting movement, and I started writing about it on my other blog. After growing my Facebook group to over 21,000 people, I knew it was time to have a blog dedicated to rock painting ideas and resources. I hope you stay awhile and enjoy the ideas.